Coincidence or a secret meeting? At a Michelin star restaurant in London, Tottenham coach Mauricio Pochettino was spotted eating with his man of confidence, Jesus Perez, - and Zidedine Zidane and David Beckham were also there. The rumours are that he is going to be Real Madrid’s next coach. The restaurant Locanda Locatelli is very close to Hyde Park in London. The Sun photographed Zidane and Beckham leaving the restaurant via the back door. Then just three minutes later, Pochettino and his assistant left as well via the same door. The Sun say that there is the possibility that there was a meeting between them all to talk about Real Madrid and to convince the coach to accept their offer for next season. 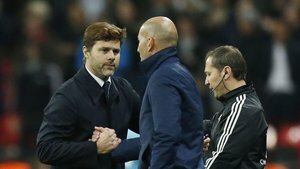 Florentino Perez wanted Pochettino before when Zidane resigned, but the Spurs boss wanted to stay where he was at the time.